Now, we always try and get our recipes tasting as close to the real thing as we can. This KFC coleslaw however tastes identical to original. That's right, done correctly (and it's hard to get this simple recipe wrong) this will taste exactly as you remember it. It sure is a bold claim, but this is one of our best recipes on this website. Go ahead, give it a go! Top tip - Always prepare this coleslaw well in advance of when you are going to use it. 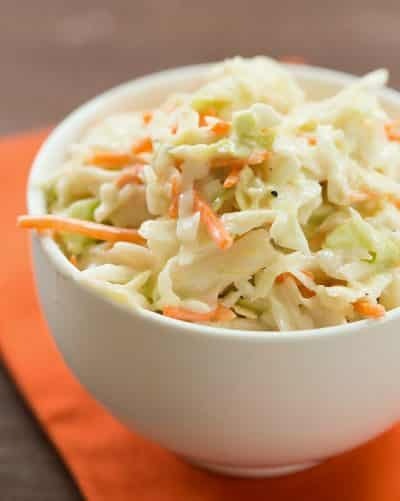 You should leave the mixed coleslaw at least 3-4 hours to allow all of the dressing to soak into the carrots and cabbage. Start by finely dicing the cabbage into small chunks, or whizz it through a food processor. Repeat with the carrot so it is finely diced, and leave to one side. In a large mixing bowl combine all of the dressing ingredients, and whisk together until everything well mixed and fairly smooth in texture. Then add in the cabbage, carrot and the onion and mix together well. Cover the coleslaw and refrigerate for several hours. It is best left overnight.